The Two Faces of January, Hollywood's latest adaptation of author Patricia Highsmith (The Talented Mr. Ripley, Purple Noon), certainly comes with a solid pedigree, but that only proves no matter how strong the source material or how expertly one sets up the shots, a bull's-eye is never assured. Set in 1962, The Two Faces of January is basically a contest of wits and masculinity. Rydal (Oscar Isaac, Inside Llewyn Davis) is an American ex-patriot working as a tour guide in Greece and conning tourists out of cash by taking advantage of their inability to tell foreign bills apart. Rydal has recently skipped going back home to attend the funeral of his father, and he's nursing a heavy heart when he spots Chester MacFarland (Viggo Mortensen, The Road), a dead ringer for the dead man. Chester is on vacation with his beautiful wife Colette (Kirsten Dunst, Melancholia), and Rydal wastes no time cozying up to them. Is he after some surrogate paternal love? Money? Colette? Chester can only wonder, because Chester is a con man, too. He sees all the angles, and thus keeps Rydal at a remove. The elder criminal quickly loses control of the situation, however, when an American private detective shows up at his hotel looking to collect the cash Chester bilked his clients out of. A fight ensues, and the P.I. ends up dead. Unfamiliar with the local terrain and unable to speak the language, Chester turns to Rydal to get them out of the country, a trek that will prove more complicated and more perilous than anyone bargained for. The fugitive journey makes up the bulk of The Two Faces of January. As they try to get from Greece to Italy and points beyond, the two men keep sizing each other up and slapping each other down, much to the chagrin of the woman in the middle. Colette has some idea of Chester's schemes, but she is altogether too trusting. She even fails to see that Rydal may be as dangerous as her husband continues to suggest. She is a pawn in their game, and written as such. Dunst is utterly wasted in this movie, as most of the actors are, but the director seems particularly eager to avoid giving her anything to do. Which makes no sense, since she's the one her co-stars are fighting over. 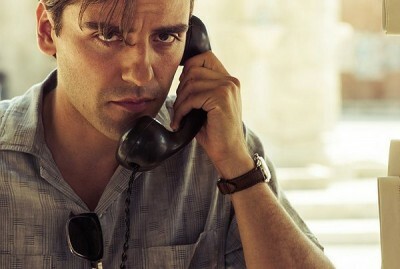 The Two Faces of January is the directorial debut of Hossein Amini, who wrote the screenplay for Drive. As with that movie, he shows a knack for sparse presentation, preferring plain language and clear storytelling. The plot is rather simple. The switch-ups and double-crosses aren't overly surprising, and the motivations are basic. Sadly, rather than use the space not occupied by story to flesh out his characters, Amini falls back on style. Clement's Purple Noon doesn't really layer on a ton of narrative, either, but the French filmmaker had a compelling central character in Tom Ripley; The Two Faces of January has no such presence. As the title implies, Chester and Rydal are two sides of the same coin, but it's fairly devalued currency. Old crook, young crook, what's the difference? The actors are committed, and they make a good pair--I'd love to see them spar for real in a better drama--but there is no heat generated by Amini's script. Lust and greed with no passion ends up just being kind of sad. On the bright side, The Two Faces of January is lovely to look at. Marcel Zyskind (The Killer Inside Me) photographs the European countryside with a reserved gloss, capturing the period details in a classical manner. The main cast looks fantastic in their vintage fashions, and the props and décor transport the viewer back in time. It's just too bad Hossein Amini didn't put as much care into the internal particulars as he did the external ones. The Two Faces of January is mastered for Blu-ray as a widescreen (2.39:1) 1080p transfer, and it looks amazing. Colors are rich and textured, and resolution is pristine. Details are sharp and the image goes deep, with strong blacks and a satisfying grain. The main audio is mixed in English 5.1 DTS-HD Master Audio. The soundtrack is carefully balanced, with nice details on the side and rear, creating a strong atmospheric experience without ever being forceful or distracting. Subtitles are available for the deaf and hearing impaired, as well as in Spanish. Bonus features offer us the usual, including six minutes of deleted scenes and nearly four minutes of bloopers. Pretty standard stuff, though Dunst and Isaac come of as pretty fun to hang around in the latter. And there's one excised scene of Mortensen detailing his version of the story of Theseus and the Minotaur that would have actually added some nuance to his jealousy. * "A Twist on the Classic Thriller" (3:09): Praise for Highsmith and the script. There is also something called "AXS TV: A Look at The Two Faces of January", a two-and-a-half-minute promo that pointlessly recycles interviews from the other featurettes. Finally, the theatrical trailer is provided. 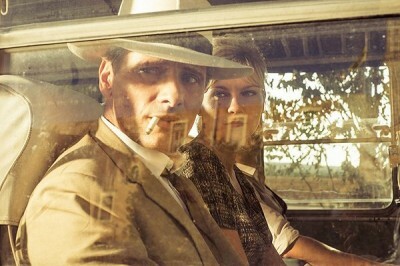 The Two Faces of January has a lot going for it: strong source material, a solid plot, an excellent cast, beautiful photography and art direction. Unfortunately, it doesn't have much depth. Writer/director Hossein Amini (Drive) goes through the motions of delivering a classically styled con man plot, but his version of Patricia Highsmith's tale of jealousy and paranoia fails to conjure up any genuine personality and emotion. The Two Faces of January is pretty to look at and efficiently made, but the hollow ruins of this narrative offer little indication of whatever grandeur might have otherwise been there. Rent It.